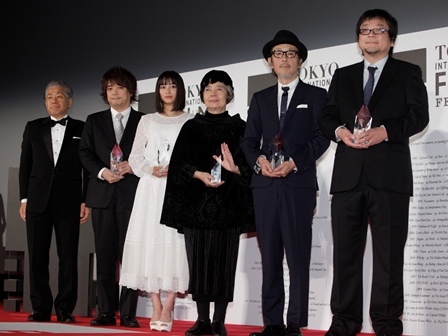 The ceremony for the 28th Tokyo International Film Festival’s new “ARIGATŌ (Thank You) Award” was held on October 31 at Tokyo’s TOHO CINEMAS Roppongi Hills. The award is to show appreciation to those who have risen in and contributed to the Japanese film industry. The winners of the award were actresses Kiki Kirin and Suzu Hirose, actor Lily Franky, animated film THE BOY AND THE BEAST director Mamoru Hosoda, and Akihiro Hino, CEO of Level-5, the developers of Yo-Kai Watch. Bathed in the light of press camera flashbulbs, the winners expressed their joy at receiving the award. Kiki, who was awarded for her indispensable presence in the Japanese film industry and many years of achievements, opened her speech in typical “Kiki-esque” style. “Yesterday I had a three-hour course to prepare for getting my elderly drivers license.” She continued, “I think getting old must be difficult. Nevertheless, when other people are kind enough to say ‘Thank you’, I feel like it’s me who has to say thank you’,” her words of appreciation heating up the room with giggles.